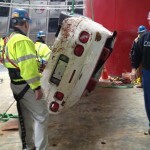 Remember the eight Corvettes that fell into a sinkhole at the National Corvette Museum? How could anyone not remember? It was even captured on security video! A few weeks ago, GM Authority ran a story on how the excavated cars were an attraction in their own right, but there were still a few Vettes left in the hole while engineers continued their project. Now the National Corvette Museum has announced that workers have pulled out the seventh vehicle, a 2009 Corvette convertible in white and red. 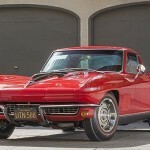 Its place in Corvette history is that it’s the 1.5-millionth Vette produced since 1953. It was optioned with the 3LT Preferred Equipment Group, Z51 Performance Package, Dual Mode Performance Exhaust, Navigation, 6-Speed Automatic Transmission with Paddle Shift and, of course, the 6.2L V8 engine putting out 430 horsepower. Final removal commenced this morning. “While the car appears to be in really rough condition, most of the major components are still there and provides a great base to work off of,” said Adam Boca of the NCM Insurance Agency and a member of the Museum’s Display Committee. 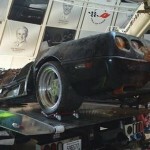 The final Corvette to be removed is the 2001 Z06 with Mallett Hammer conversion. 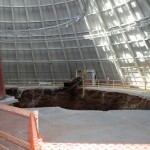 It is still buried underneath so they will have their work cut out for them. All the damaged Corvettes will be together for a special display through August 3rd, where they then will be moved to the rebuilt Skydome for the Museum’s 20th Anniversary Event August 27-30, 2014.